Ashley and Alauna from USF: "We are definitely coming back!" The University of South Florida (USF) was one of the university groups from the USA, staying at ILISA this last month. They participated in ILISA's Summer Program; enjoying weekend trips, cultural activities and Spanish classes. Ashley and Alauna share their thoughts on this program in this interview. "We fell in love with the program at ILISA and it was a great benefit we could take university credits as well! We did so many interesting things during our time, I don’t know where to start. Hiking at volcanoes, swimming under waterfalls, a visit to a coffee plantation, amazing national parks; the nature is magnificent and there are so many amazing animals! We also got to know the Costa Rican culture through all cultural activities, of which we loved the dance classes best!" According to Ashley and Alauna, their progress in speaking Spanish was beyond their expectations. "The classes had a great atmosphere and the teachers are all professionals who love what they do. We have learned so much." A standard part of the Study Abroad Program is that students stay with a host family. "That was the most amazing experience! I love my host family so much and honestly I could not have asked for a better host family. They were so giving, welcoming and helpful and we felt at home right away!" "This Study Abroad Experience has been amazing, and we are definitely coming back!!" Please read the whole interview here. Want more information about one of our other programs? Download our brochure here! 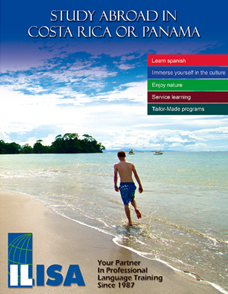 Are you excited for your Spanish Program and preparing for your stay in Costa Rica? Studying abroad is one of the best way to improve your language skills. To get the best results, you should prepare yourself before you leave. On our website we have set aside the best tips to get you started. Have you ever thought of letting your subconscious do the work? Read your text and/or listen to your tape right before you go to sleep. Find this and many other ideas for achieving the best results on our website. A breakthrough for Costa Rica! For the first time in its history, it has received the honor of being granted World Heritage recognition from UNESCO. Strange stone spheres, crafted by pre-Colombian peoples in the southern region of Costa Rica, were given this international recognition. Speculation still exists about the formation of the spheres, as well as their usage by the native peoples that inhabited the above mentioned regions prior to the Spanish Conquest. Most archaeologists favor the theory that the granitic rock was somehow worked by humans into the almost perfectly spherical forms. Others believe natural forces may have caused the creation of the spheres. Students studying at ILISA can have a look and discuss their origin themselves; the National Museum in downtown San Jose holds a collection of these artifacts. We also organize regular trips to this museum, giving students a more in-depth insight in the background of these mystery spheres. Interview with Ashley and Alauna. Costa Rica best holiday destination! Preparing for your Spanish Program. Costa Rica es el mejor país para pasar sus vacaciones! Costa Rica es el destino turístico más preferido! Esto no era un secreto ya lo sabiamos, pero ahora la Global Tourism Monitor Survey ha confirmado. También destaca el país de ¨Pura Vida¨ como el país con la mejor experiencia en vacaciones. Usted este interesado en experimentar este magnífico país? Únete a nuestro programa de verano o cursos regulares! Comienza a preparar su estancia? Lee nuestros consejos sobre dónde ir en tu tiempo libre! Le interesaria saber cómo ILISA le ayudar a planear su visita a Costa Rica? Echa un vistazo a nuestra página web o síguenos en Facebook y Twitter. "It felt like home as soon as I walked through the doors. The staff exceeded my expectations and always had smiles on their faces. Thank you all for making my stay and study at ILISA wonderful!!" La semana pasada, nuestos estudiantes disfrutaron de una degustación de frutas como parte de su programa de actividades culturales. Probaron Carambola, Marañón, Níspero, Querepe, Guaba, Cas, Guayaba, Jocote and Guanábana: Todas estas son frutas exóticas de Costa Rica; estas varían de dulce a (muy) acido. Esta fue una gran oportunidad para probar la variedad de frutas Costa Rica ofrece! Sabores intrigantes y algunas veces sorprendentes. Usted esta interesado en otras actividades que organizamos para nuestros estudiantes? Eche un vistazo a nuestra página web!